While perusing old editions of American Modeler, I came across an advertisement for a plastic model of the Wright Cyclone 9 radial aircraft engine that was made by Monogram. 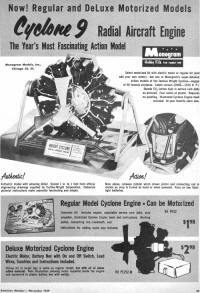 The ad from the November 1959 edition can be seen to the right. 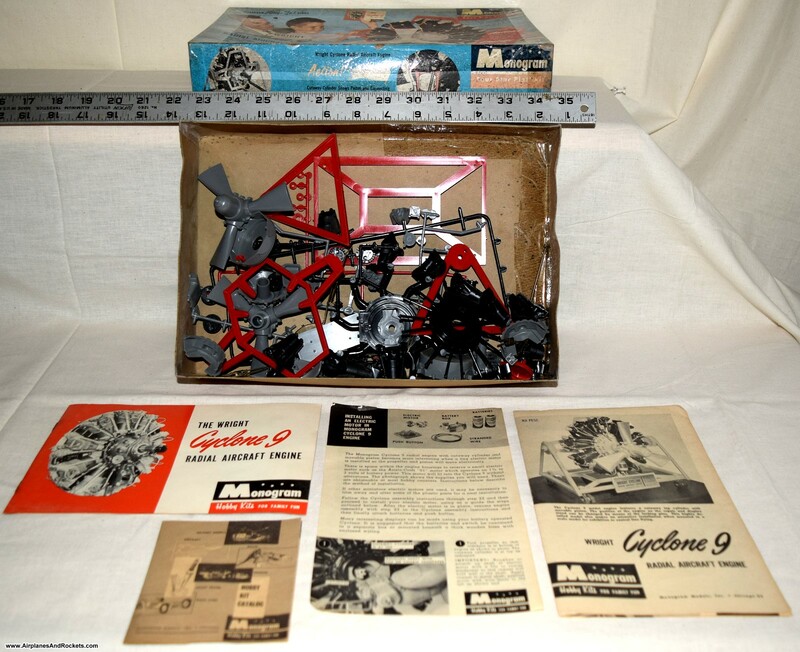 A guy in Louisiana sent me an e-mail asking whether I would like to buy a pair of kits that were in his father's basement. 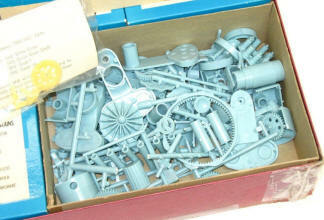 His father was a lifelong modeler and had recently passed away. 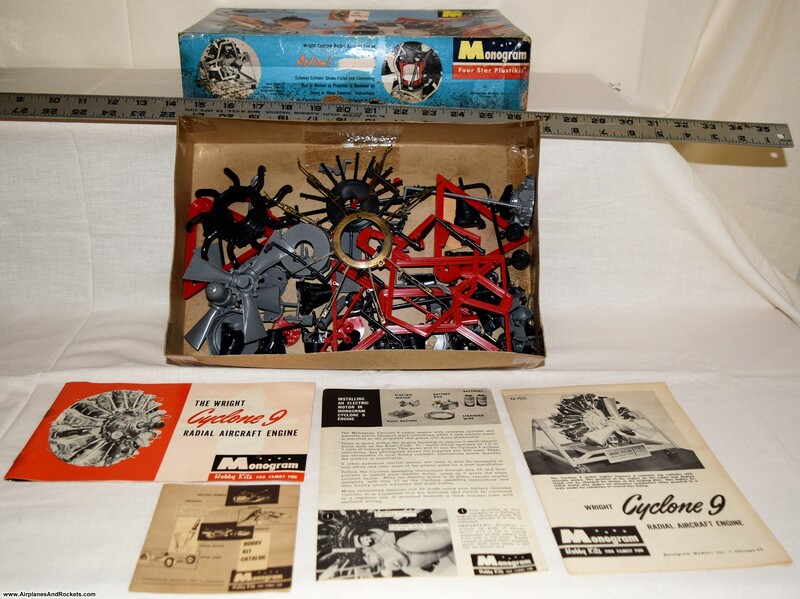 As you can see by the photos, the boxes are a bit rough from high humidity, but the plastic parts inside and the paperwork are all in great condition. Because of openings in the boxes, a couple of the smaller parts had gotten lost, but I did an inventory of both kits and know that there is one complete kit with 100% of the parts, and the second has most of the major parts. The parts groups are also shown. Click the thumbnails for larger versions. 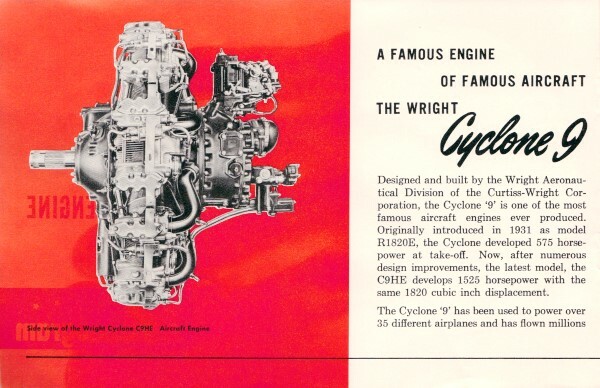 Designed and built by the Wright Aeronautical Division of the Curtiss-Wright Corporation, the Cyclone '9' is one of the most famous aircraft engines ever produced. Originally introduced in 1931 as model R1820E, the Cyclone developed 575 horsepower at take-off. Now, after numerous design improvements, the latest model, the C9HE develops 1525 horsepower with the same 1820 cubic inch displacement. The Cyclone '9' has been used to power over 35 different airplanes and has flown millions of hours in both civil and military aircraft. More than 11,500 engines have been operated commercially and approximately 103,- 000 have been delivered to the military services. The Cyclone is a nine cylinder, single row, radial aircraft engine of 1820 cubic inch displacement. Originally designed over 25 years ago, it has gone through numerous design changes and engineering refinements - all accomplished without altering the basic simplicity of the engine. 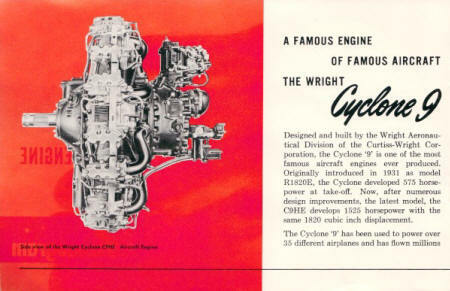 As a result, the Cyclone is the lightest, most powerful and economical nine cylinder aircraft engine in the world. 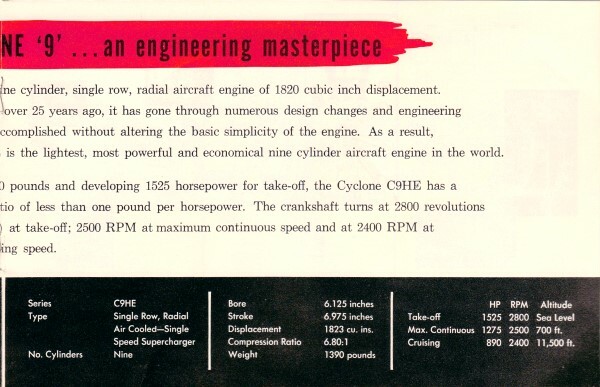 Weighing only 1390 pounds and developing 1525 horsepower for take-off, the Cyclone C9HE has a power-to-weight ratio of less than one pound per horsepower. The crankshaft turns at 2800 revolutions per minute (RPM) at take-off; 2500 RPM at maximum continuous speed and at 2400 RPM at recommended cruising speed. This outstanding progress is the result of continuous engineering refinement of a basically sound design. In 1933 the famous "dynamic damper," which allowed higher crankshaft speeds, was introduced in the model R1820F Cyclone. Forged steel crankcases were applied to the Cyclone "G" -first air-cooled radial engine to develop 1000 horsepower, in 1935. 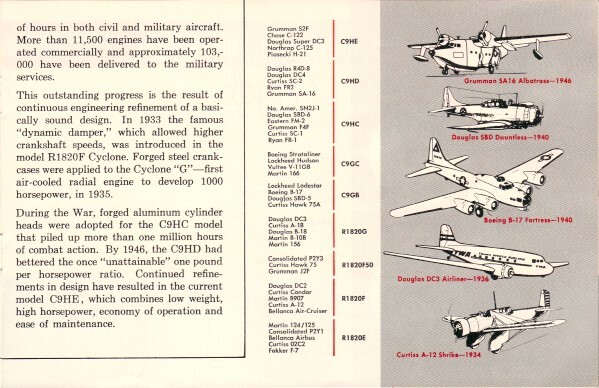 During the War, forged aluminum cylinder heads were adopted for the C9HC model that piled up more than one million hours of combat action. 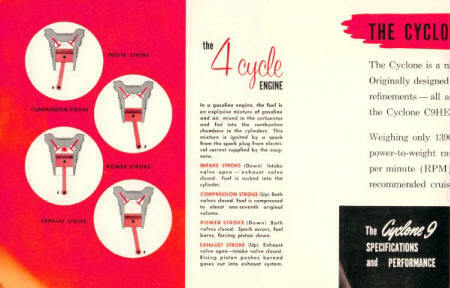 By 1946, the C9HD had bettered the once "unattainable" one pound per horsepower ratio. 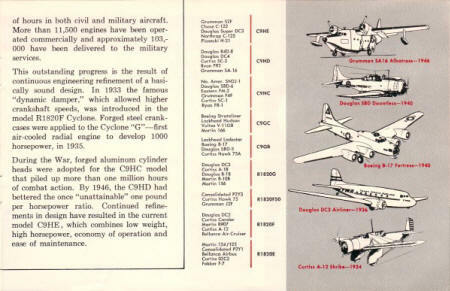 Continued refinements in design have resulted in the current model C9HE, which combines low weight, high horsepower, economy of operation and ease of maintenance. In a gasoline engine, the fuel is an explosive mixture of gasoline and air, mixed in the carburetor and fed into the combustion chambers in the cylinders. This mixture is ignited by a spark from the spark plug from electrical current supplied by the magneto. INTAKE STROKE (Down) Intake valve open - exhaust valve closed. Fuel is sucked into the cylinder. COMPRESSION STROKE (Up) Both valves closed. Fuel is compressed to about one-seventh original Volume. POWER STROKE (Down) Both valves closed. Spark occurs, fuel burns, forcing piston down. EXHAUST STROKE (Up) Exhaust valve open-intake valve closed. Rising piston pushes burned gases out into exhaust system. The exploded and cut-away drawing above shows the six basic assemblies of the Cyclone '9' engine. These are explained on the opposite page. A seventh assembly-the exhaust system-is not shown, as the design of the exhaust varies with the installation of the engine in the aircraft. 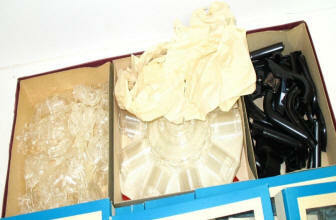 The crankcase is the basic shell of the engine, housing the crankshaft, and to which are mounted the other assemblies. The Cyclone '9' crankcase is machined of a high tensile alloy steel forging and weighs only 107 pounds. This material was chosen to provide maximum-power-section strength and a rigid and durable mounting surface for the cylinders. 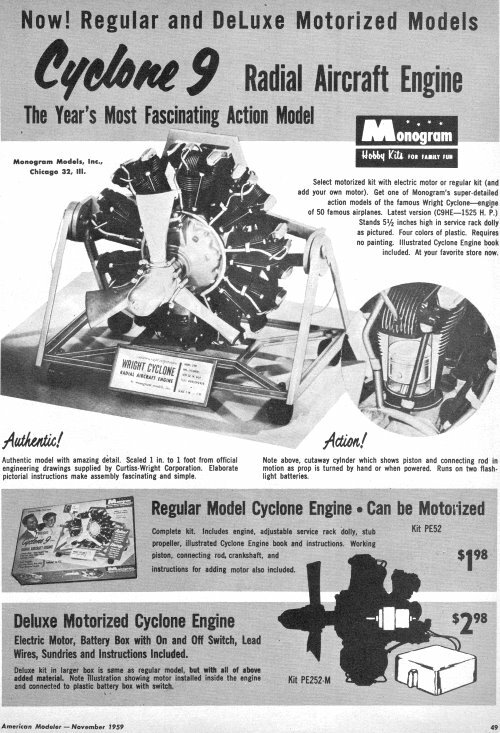 Earlier Cyclone engines used a crankcase of aluminum. 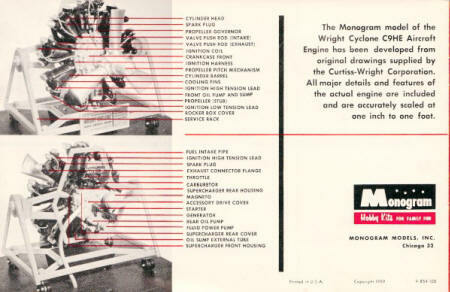 This assembly includes the crankshaft, connecting rods, pistons, cylinders and valves. Cylinder barrels are deep nitrided steel and fitted with aluminum cooling fins. Cylinder heads are machined of aluminum forgings with deep cooling fins. The master connecting rod is in No.1 cylinder (at top of engine) with articulated rods to the other eight pistons. Pistons are steel with nickel plating in the ring areas. Intake and exhaust valves are sodium-filled and valve sterns are colmonoy-coated. The supercharger is basically a pump to provide a larger Volume of air-fuel mixture to the combustion chamber of each cylinder. The Cyclone '9' supercharger has an 11.4 inch diameter impeller, fitted to the rear section of the crankcase. Behind the supercharger are located the various accessory drives for starter, magneto, generators, fluid power coupling and oil pumps. 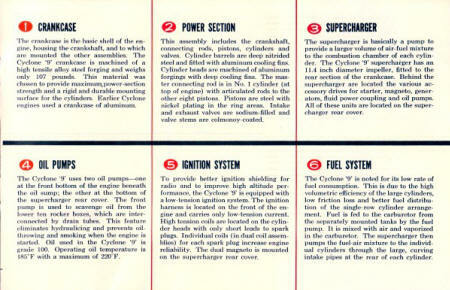 All of these units are located on the supercharger rear cover. 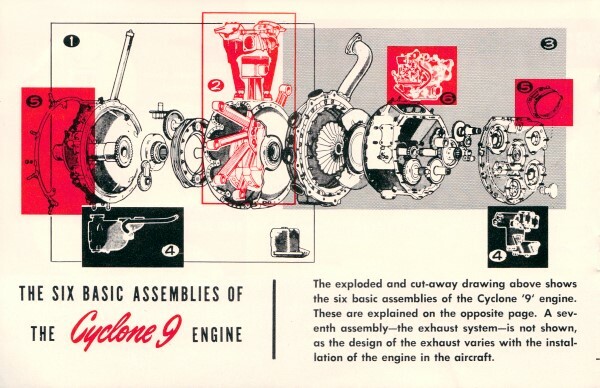 The Cyclone '9' uses two oil pumps-one at the front bottom of the engine beneath the oil sump; the other at the bottom of the supercharger rear cover. The front pump is used to scavenge oil from the lower ten rocker boxes, which are inter-connected by drain tubes. This feature eliminates hydraulicing and prevents oil-throwing and smoking when the engine is started, Oil used in the Cyclone '9' is grade 100. Operating oil temperature is J85°F with a maximum of 220°F. To provide better ignition shielding for radio and to improve high altitude performance, the Cyclone '9' is equipped with a low-tension ignition system. The ignition harness is located on the front of the engine and carries only low-tension current. 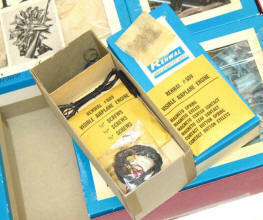 High tension coils are located on the cylinder heads with only short leads to spark plugs. Individual coils (in dual coil assemblies) for each spark plug increase engine reliability. The dual magneto is mounted on the supercharger rear cover. The Cyclone '9' is noted for its low rate of fuel consumption. This is due to the high Volumetric efficiency of the large cylinders, low friction loss and better fuel distribution of the single-row cylinder arrangement. 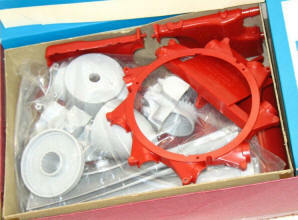 Fuel is fed to the carburetor from the separately mounted tanks by the fuel pump. It is mixed with air and vaporized in the carburetor. The supercharger then pumps the fuel-air mixture to the individual cylinders through the large, curving intake pipes at the rear of each cylinder. 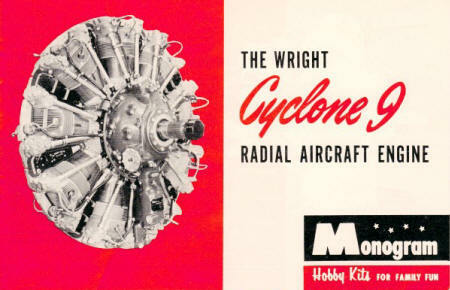 The Monogram model of the Wright Cyclone C9HE Aircraft Engine has been developed from original drawings supplied by the Curtiss-Wright Corporation. 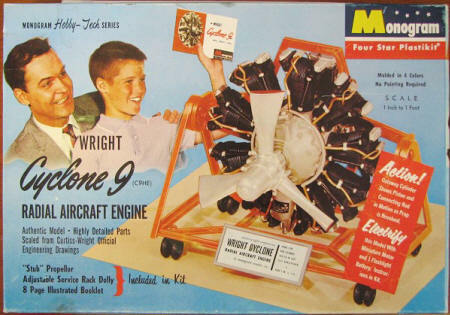 All major details and features of the actual engine are included and are accurately scaled at one inch to one foot.